This past week, Mr. Myrt and I went a-hunting via computer for a family reunion location. We ran across a place with this absolutely ideal office space. Look at all those unused shelves just waiting for genealogy and history books. It's a pretty cool room, but seriously, why waste this space on a vacation retreat? This should be imported into our own homes. Who needs a kitchen anyway? We can always send out the laundry, right? I wish, but I digress. Last week we talked about developing analysis skills and referred to Chapter 1 of Elizabeth Shown Mills' Evidence Explained: Citing History Sources from Artifacts to Cyberspace, 3rd edition. This week we're on to citations. WHAT'S THAT HUGE GROAN I HEAR? Worried? 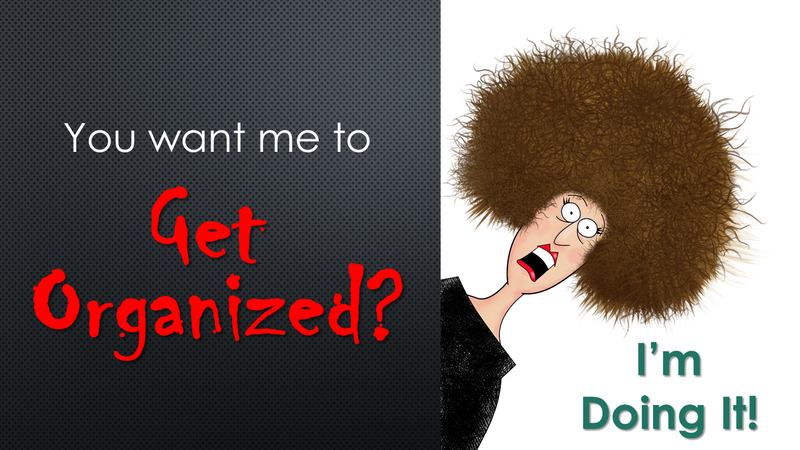 Not interested in citations? Thinking you could get a lot of genealogy done if it weren't for the citations that take too much time to create? 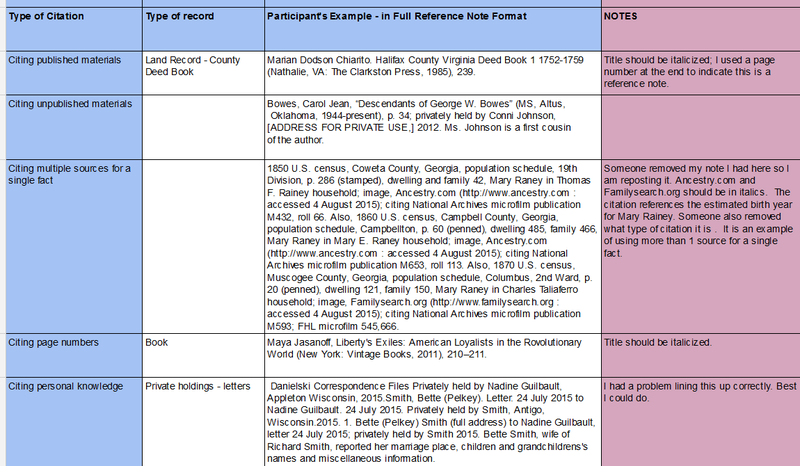 Well, to properly organize our genealogy research findings and arrive at reasonable conclusions, we've got to get those citations in standard, consistent format. You know it has to be done. Now is your chance to do it! Undoubtedly, if you purchase the Kindle version, you'll want advice on how to print the pages from your tablet. Here are some suggestions from our friends at MakeUseOf: How can I print parts of a book from the Kindle app on my computer? 2. 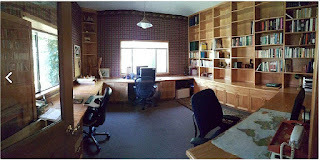 Refer to Citations available online at Elizabeth Shown Mills website. www.EvidenceExplained.com. Here you may join the site in order to search for topics and post comments in the EE Forum. Ol' Myrt here spends time here searching for sample citations that meet my goal to get citations in standard format. 4. Download a copy of DearMYRTLE's What Does SHE Say? Study Group citation samples based on Chapter 2 Evidence Explained: Citing History Sources from Artifacts to Cyberspace, 3rd edition. Last fall, we challenged panel participants to create citations based on their own research findings. You'll find the Google Sheet here. 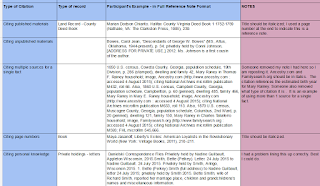 Note there are limitations using Google Sheets, such as the inability to italicize only part of a cell's content, but the pink column titled "Notes" explains what should be done to make the citation more accurate. By downloading this file, you can use MS Excel and add to the list once you start crafting citations for documents and photos you've collected during your research. 4. 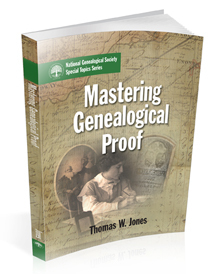 Explore citation templates in your genealogy software of choice. 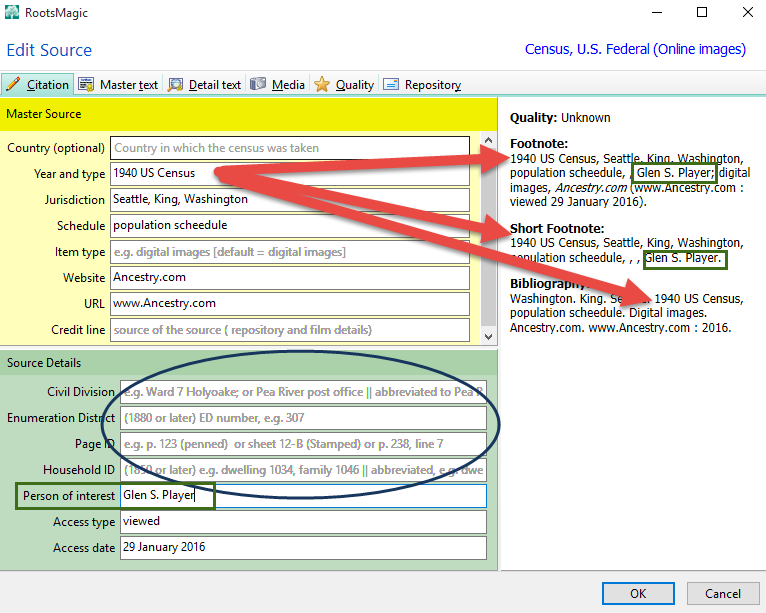 Here's a screen shot from RootsMagic 7 where I'm planning to create a citation for the 1940 US federal population schedule from digital images online at Ancestry.com. First I selected a new source, then "filled in the blanks. 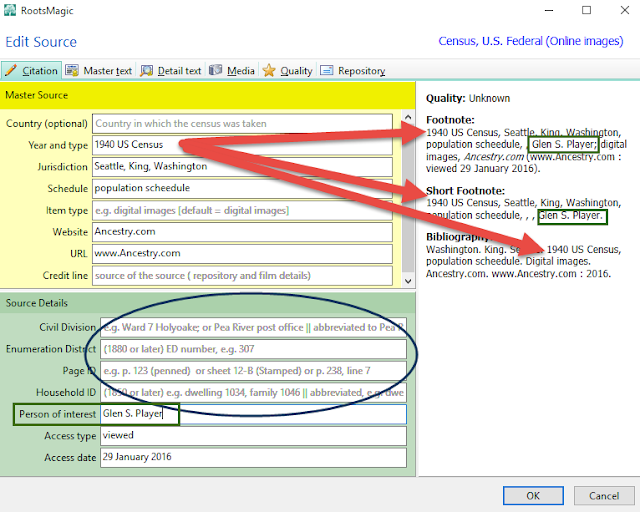 The red arrows below show where my typing "1940 US Census" end up when the software displays or prints out the citation in footnote, short footnote or bibliography format. Since the census image "person of interest" is my father, Glen S. Player, I typed it in the field I've now highlighted with a green bordered box. See where it appears in Footnote and Short Footnote side of the dialog box. I've placed a blue oval where I need to type the civil division, enumeration district, page id, household id. What is there in grey text is merely a sample, and will be replaced by my typing. EXTRA Credit - Watch sessions 3 and 4 of the What Does SHE Say? Study Group where the panel participants discuss Elizabeth Shown Mills citation formats.